Though am running a month of blogging marathon, i couldnt stop myself to dish out some super duper healthy Alsi ki Pinni for this month's Shhhh cooking secretly event. This month's Shhh Cooking Secretly, a monthly event started by me, which is now hosted by Mayuri Patel is taking you all to Haryanvi Cuisine. You might have noticed that since few months, we are cooking from different Regional cuisines of India. After dishing out some delightful dishes from Gujarati cuisine, this month's event is all about Haryana. 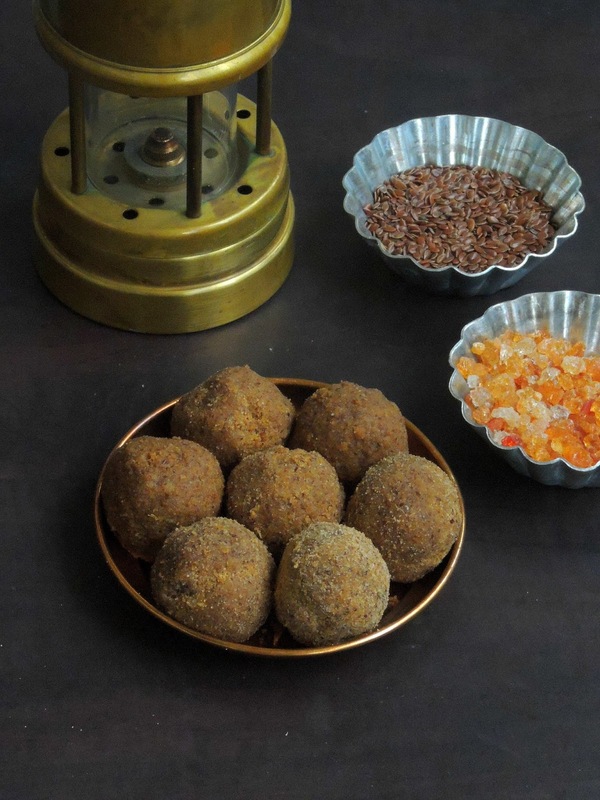 Alsi ki pinni is a very popular sweet in Haryana which is prepared with Alsi aka flax seeds, whole wheat flour, ghee, edible gum/gond, jaggery and cardamom powder.Pinni are prepared during winter as they gives lot of warm and energy to the body. Alsi aka lin seeds are extremely healthy and quite beneficial for cold and cough, as they gives strength. Lin seeds contains many nutritional properties, which control the cholesterol level of your body. My recent find in Indian grocery is a packet of frozen green channa, seriously i was the happiest person in the world. Yes i have been looking for this fresh green channa since a long and finally i saw them in frozen section. Without any hesitation i grabbed a packet happily. I have been hunting for this green channa since a long and everytime i go for Indian grocery, i will ask the saleman about these green chickpeas. Unfortunately they usually says that its a most demanded one as North Indians living in Paris dont forget to buy them in huge quantities. Thank god, one of my long wait came to an end few days ago. Back home i cooked a delicious one pot meal with those frozen green channa along with potatoes as biriyani. And this biriyani came out extremely flavourful, delicious and prefect to pack in anyone's lunch box. Trust me this green chickpeas and potatoes works awesome together in dishing out this gluten free one pot meal. My kids are meat lovers, though i love vegetarian foods, i had an obligation to cook meaty foods atleast a meal per day. Though i cook meat dishes often, i post them very rarely in my space. If you check non vegetarian dishes in my space you will find them lesser than the vegetarian dishes. Dunno why i think twice to post meat friendly dishes here. Since its sunday today, i felt like posting this flavorsome green chicken biriyani aka Herbal chicken biriyani i cooked recently for our lunch as sunday special. 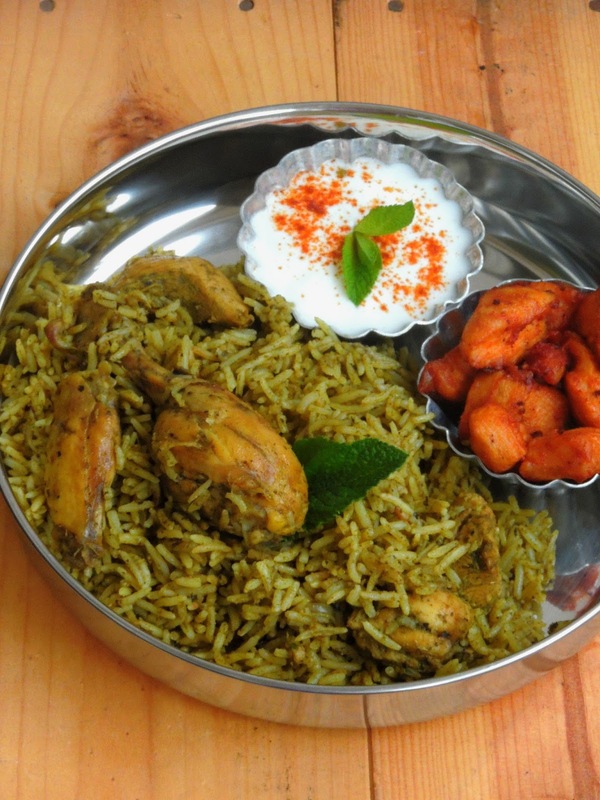 This chicken biriyani tastes absolutely fabulous with eye pleasing green colour. Though this dish is also named as Nilgiri Biriyani, i felt like naming this dish as Herbal chicken biriyani as this dish calls handful of mint and coriander leaves with couple of spices. Yes this dish is completely cooked in a special mint & coriander leaves paste grounded along with whole garam masala, green chillies. 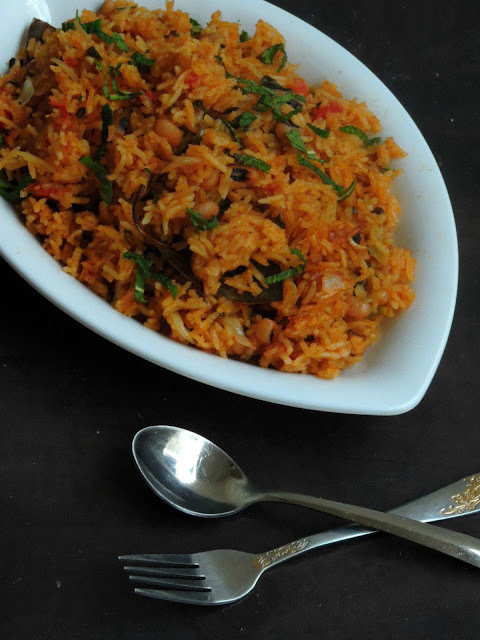 This briyani is tomato-free dish, only onions is used in this dish with ginger garlic paste. I used yogurt to prepare this biriyani, if you want to make them more flavourful, just replace the yogurt with freshly squeezed coconut milk. If you dont have any ideas for some lunch box friendly dishes on your mind, dont get tensed. 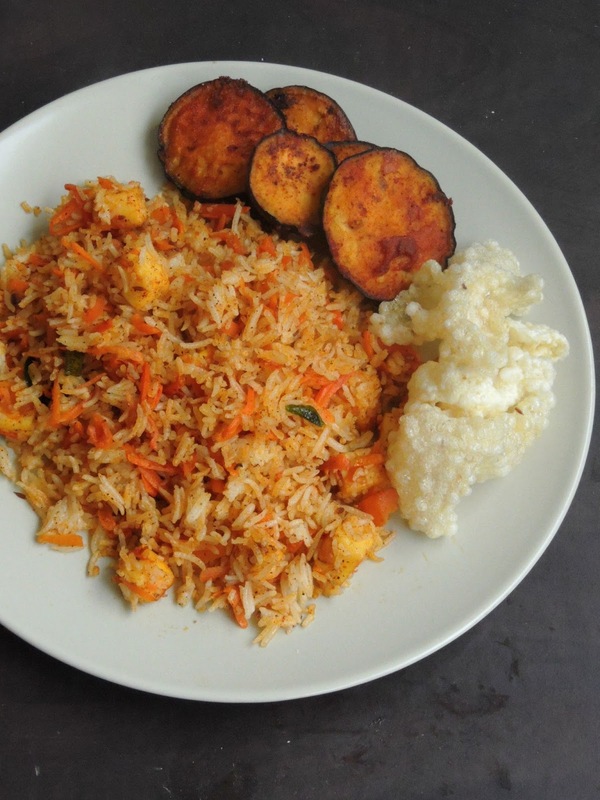 Just check my today's dish and am sure this simple but yet a healthy and delicious rice dish will definitely please your kid's tastebuds. I have seen rarely kids saying 'no ' to paneer, obviously my today's rice dish is one of the easiest dish you can prepare in less time than you can imagine. Honestly, my kids are ardent fan of carrot rice, if i feel bored or lazy to cook a meal, i will stick definitely with easy dishes. One among those easy dishes is Carrot rice. Just freshly grated carrots when spiced with usual spice powder,once sauteed and mixed with rice makes a quick carrot rice. If you add some cubed paneer to this simple rice, trust me this simple, quick carrot rice will get an another avatar and becomes a calcium rich rice dish. If you have leftover cooked rice and cubed paneer in your fridge, this rice gets ready within less than 10 minutes. If you want something easy and cheesy to pack in your kid's lunch box, you should definitely take a look to my today's post. Its quite an easy cheese rolls you can bake either with store bought bread dough or pizza dough or else with homemade bread dough. This time i opted for a multigrain mixture of flours as i was planning to bake a bread rolls with rye flour, spelt flour, oats,quinoa,pearl millet flour along with wheat flour. 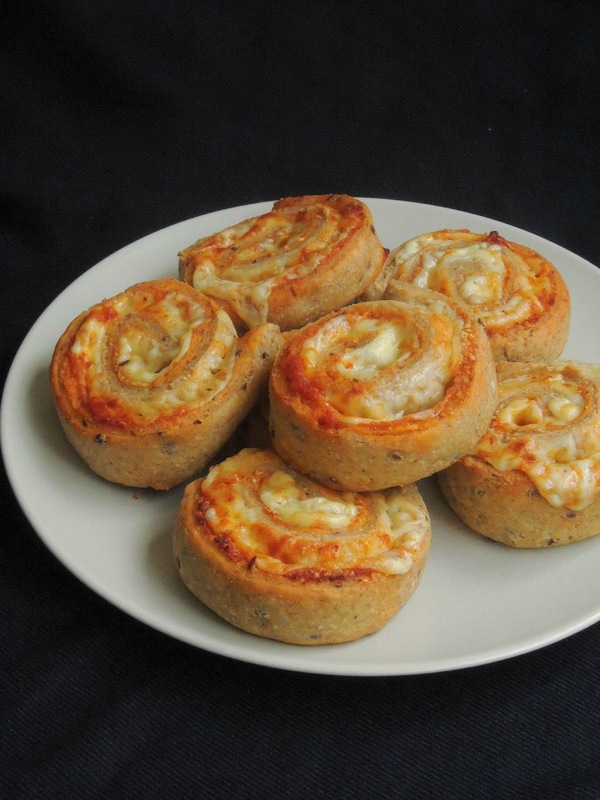 And this wholegrains as flour works out awesome to bake out this cheesy rolls. My kids enjoyed thoroughly this cheese rolls with simple cucumber salad for their lunch. 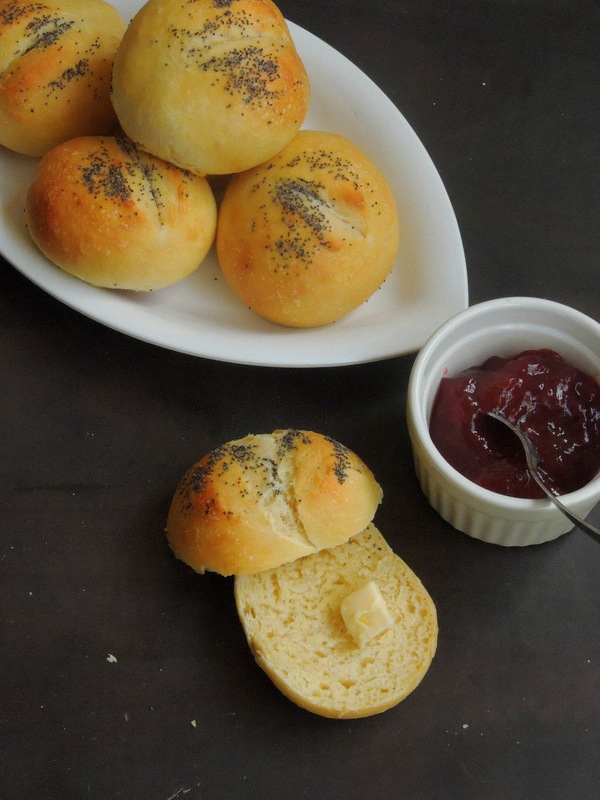 Yes served along with a salad or cold soup for a summer lunch or picnic these cheese rolls makes an excellent lunch to finish without any guilt. As much as like always, i prepared my own tomato pesto which I have already posted here, but this time i prepared this vegan pesto with some fresh cherry tomatoes & sun dried tomatoes and this combination works awesome. After making two delicious kid's friendly lunch box dishes, i couldnt stop myself making an another delicious lunch box dish with a healthy twist in it. 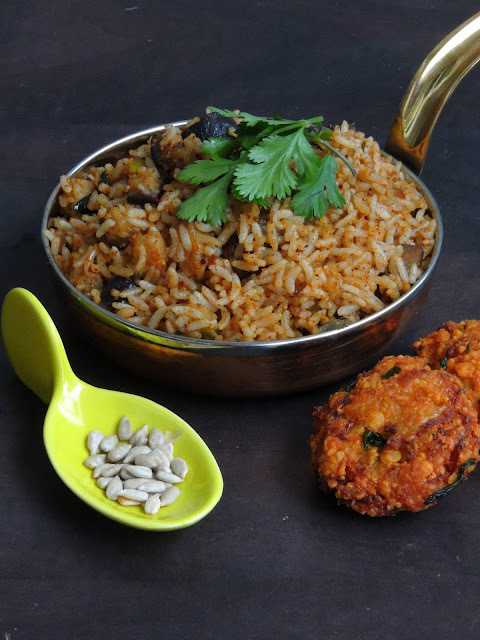 Usually i love to make eggplant rice with a special spice powder to make them more flavourful and delicious. And my today's recipe is definitely a different recipe you would have never crossed yet. I prepared this eggplant rice with a flavorsome rich spice powder using sunflower seeds along with other usual spices. I have prepared couple of breads using sunflower seeds, but never tried them in my cooking. Since i want to make a super duper twist to the usual eggplant rice, i simply opted for a spice powder which goes for Sunflower seeds. Initially i was bit skeptical to use sunflower seeds in this spice powder but seriously i want to give a try eventhough its the first time am preparing a spice powder with sunflower seeds. Packing a kid's lunch box is definitely a hard task especially for picky eaters. However i dont pack foods for my kids as they dont carry their lunch boxes. We are running a month of blogging marathon during this whole month of April. With 4 themes for 4 weeks, i have been posting for the past three weeks with different themes. 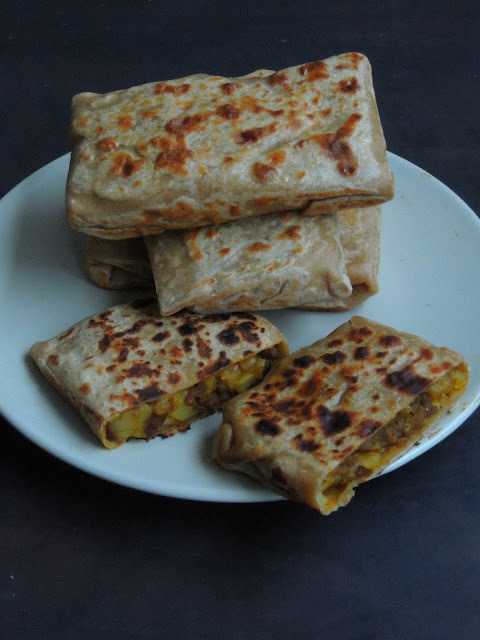 And the final theme for this week is going to be Kid's Lunchbox recipes, after an easy breezy one pot meal, am posting a terrific paratha pockets which calls for a fabulous potato and minced meat filling. My family cant survive more than a day without eating meats, yes they are meat lovers. We are running successfully a month of blogging marathon for the past three weeks. And this week is the last week of this Mega marathon. You might have noticed that am running this month's marathon with 4 themes for 4 weeks. For the first week i picked International Breakfast dishes, 2nd week was No Onion No Garlic Recipes,3rd week was Wholegrains. And for the last week of this blogging marathon is going to be Kid's lunch box recipes. Yes this week's posts are going to be kid's friendly lunch box dishes that you can pack them easily with less efforts. For the first day of this week's theme, am posting this simple, yet a flavourful protein packed biriyani i dished out few weeks back for our meal. My kids loves beans very much in their diet, obviously i dont forget to add them whenever i feel like feeding them easily with this protein rich beans.My young one's favourite black-eyed peas, he just love to munch them once they gets pressure cooked. Its been a while, i baked bread at home, if i dont bake a weekend, everyone at home will complain that am not baking at home. And one of my recent visit to a nearby organic shop pulled me to get a packet of spelt flour. Spelt is one among the wheat varieties and its one of the ancient grains which is very much used in the place of wheat flour. Since this grain is completely healthy, they are used in many European countries like Germay , Austria where spelt loaves and rolls are widely available in bakeries. And the unripe spelt are dried and eaten as well. Beer is brewed from spelt in Bavaria and Belgium. Spelt is an excellent source of protein, dietary fiber, several vitamins and many dietary minerals. 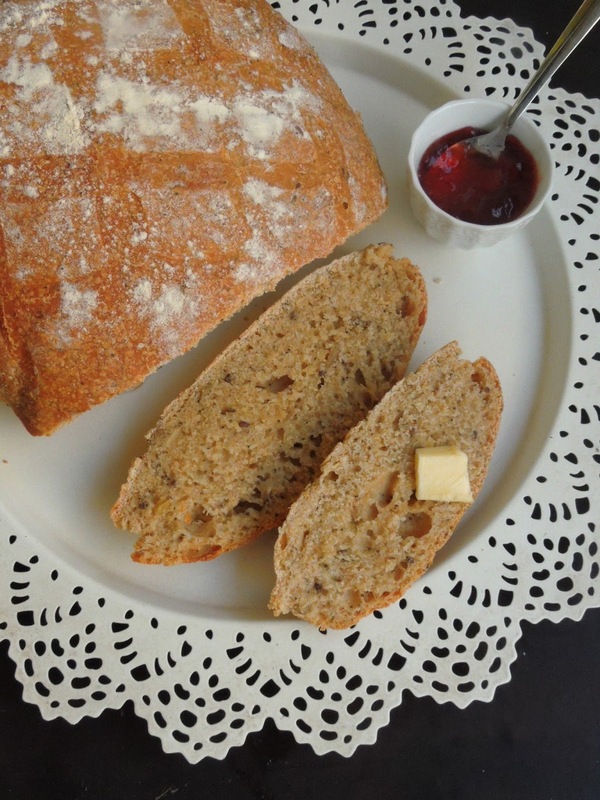 Since this flour is high in protein and low in gluten lends a slightly sweet and nutty flavor to the bread. Jowar is a gluten free grain and its an incredible millets, i have been looking for a chance to cook with this grain and finally during my last trip to India i grabbed a packet of broken jowar from an Organic store. Obviously when i picked this organic broken jowar, the first dish came to my mind is Upma. Yes upma is the only dish we can think about when you grab these sort of unique broken grains na. 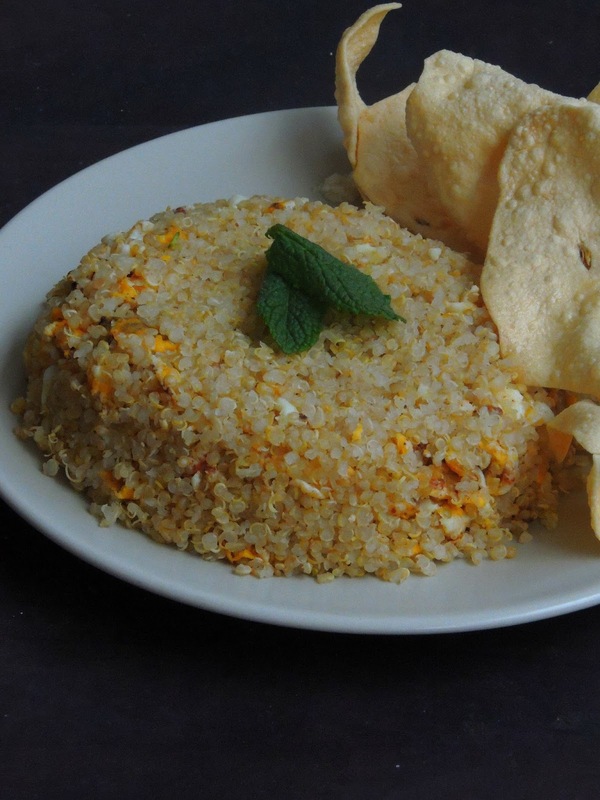 However when i picked 'Wholegrains' as the theme for this week's blogging marathon, i thought of making a different dish from that usual upma. You might have noticed that am running a month of blogging marathon with 4 themes for 4 weeks. After dishing out 6 international breakfast for the first week, i opted for No Onion No Garlic recipes for the second week. And now for the third week, my theme was Wholegrains. After three different dishes with three different wholegrains, i couldnt stop myself to post this incredible sambar bath with broken jowar grains. If i pick 'Wholegrains' as theme for this week's Mega marathon, how can i keep myself away from Oats. Yes oats, this fibre rich grains are my most favourite wholegrain which i never fail to grab them whenever i go to the grocery. 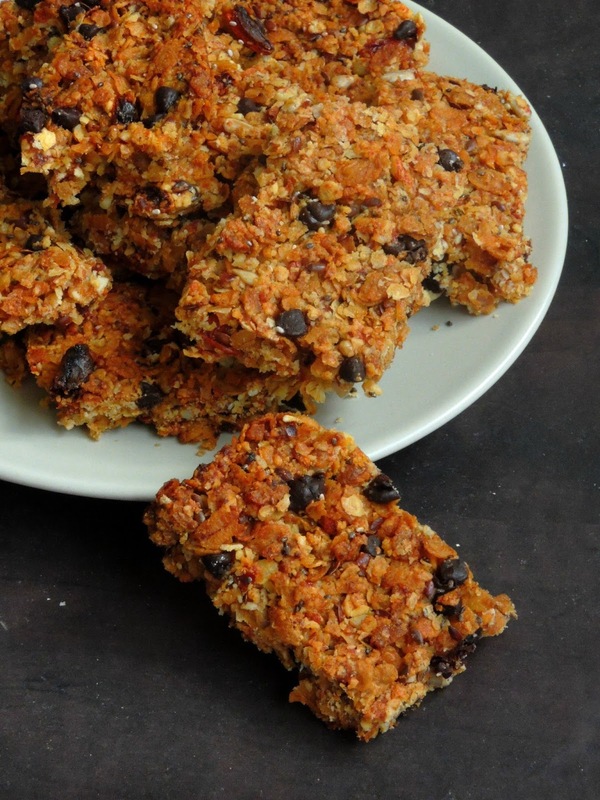 Oats is an another versatile wholegrain which works awesome to cook any sort dishes with. I have already dished out many delicious with this incredible grains. Oats makes an excellent breakfast, yes it a great way to start you day with this incredible grain. Add your favourite nuts and fruits to a bowl of your oatmeal. You can add oats in your daily menu, yes use oatmeal while baking some cookies which is quite a favourite evening snacks for kids of all ages. Dont forget to add oats flour or whole oats while baking muffins or breads. And also sprinkle oat bran in your hot or cold cereal. Oats are an excellent source of manganese, they are also very good in phosphorus and a good source of copper, vitamin B l, dietary fiber, zinc and protein. Quinoa, this nutty grain have its own place in my weekly cooking. I dont forget to cook these healthy, protein rich grain often to include in our weekly menu. Since these grains are seriously versatile you can dish them as much as you like from starters to desserts. 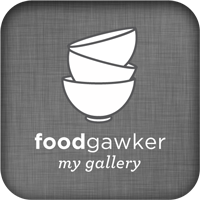 If you want to get ideas to cook with this incredible grains dont forget to check my space. Yep i have already posted many delightful dishes prepared with this grain. Coming to today's my post, its quite an easy and quick quinoa dish which calls for a couple of eggs, garam masala powder and chilly powder to spice this excellent dish. Coming to Quinoa is one of the ancient grains as much as like Amaranth, barley and farro which are rapidly growing in popularity because of their good array of health benefits.Quinoa was kown to the Incas as 'the mother of all grains' and it was first cultivated over 5,000 years ago. Though hundreds of types of quinoa do exists, the most common versions available in stores are white, red and black quinoa. Hope you guys might have enjoyed 6 different No Onion NO Garlic gravies thoroughly which i have posted during last week. And this week's posts are going to be different and very healthy as well. Yes this week's of blogging marathon theme is Wholegrains. Am an ardent fan of oats, quinoa and i dont forget to grab them whenever i go for groceries. Recent addition to my pantry is Organic rye flour and spelt flour. Rye flour is one of the flour which is very much underrated though this flour have its important place in Scandinavian cuisine.Rye flour tends to be more nutritious than wheat or barley because of the whole nature it comes in, with endosperm, which is in the outer hull of the rye berry or kernel. The endosperm holds potent starches as well as fiber and nutrients. It’s much harder to separate and remove the germ and the bran from the endosperm during the milling, therefore carrying with it more vitamins and nutrients into the end product of rye flour. Potatoes are our family favourite vegetable, we can survive for many days with anything cooked with potatoes. Obviously potatoes have their own place in my vegetable basket. My today's post is a well known curry dish which is quite popular in North India especially in the state of Uttar pradesh. 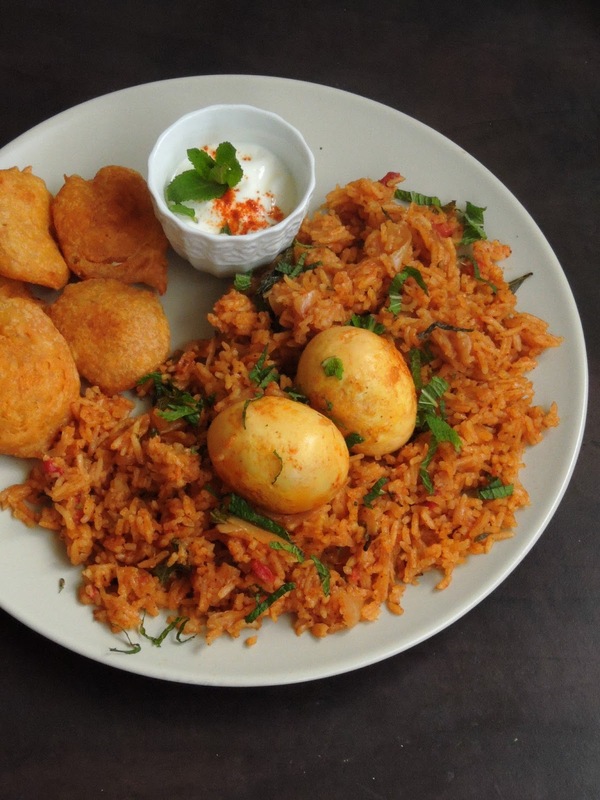 Its a breakfast dish served along with puffed Indian fried breads aka pooris. And this dish is one of easiest side dish you can prepare with less efforts. Since its No Onion No garlic recipe, this dish gets ready easily for a quick weekend dinner or a simple weekday's breakfast. 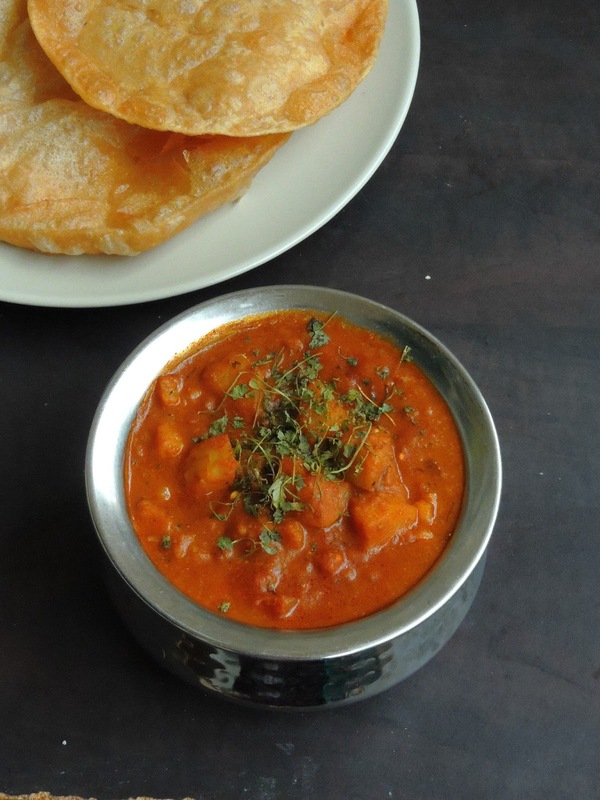 With usual spice powders and dry mango powder, this curry will makes you happy to relish with parathas or rotis. While i was looking for something simple, yet a comforting food with tomatoes, i crossed this ultimate Tomato saar at Pooja's Space. 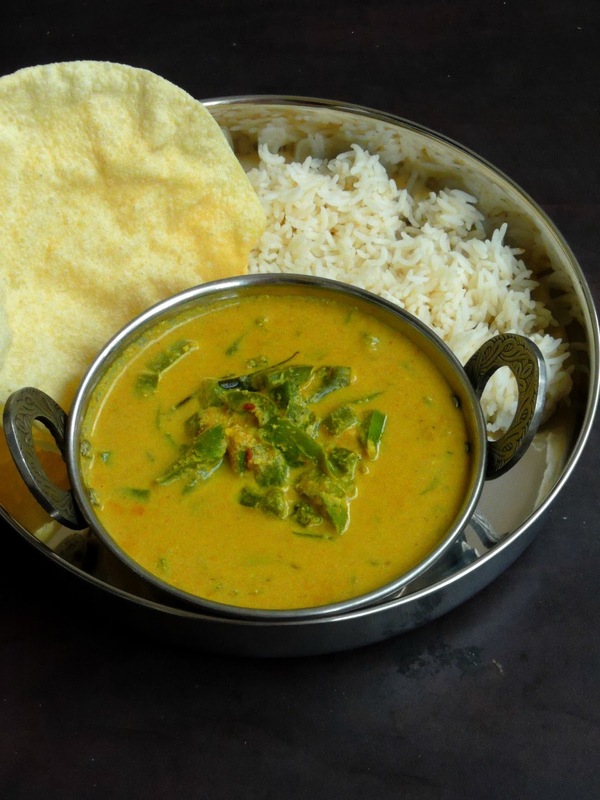 This dish is one of popular Goan vegetarian curry which is often cooked in most of the Goan families. This curry is a simple dish which is completely free from onions and garlics. Obviously if you dont eat onions and garlic or else if you follow a strict diet and you cant eat onions or garlic, this tomato curry will definitely please your tastebuds. This dish is an easy dish with simple spices in it. 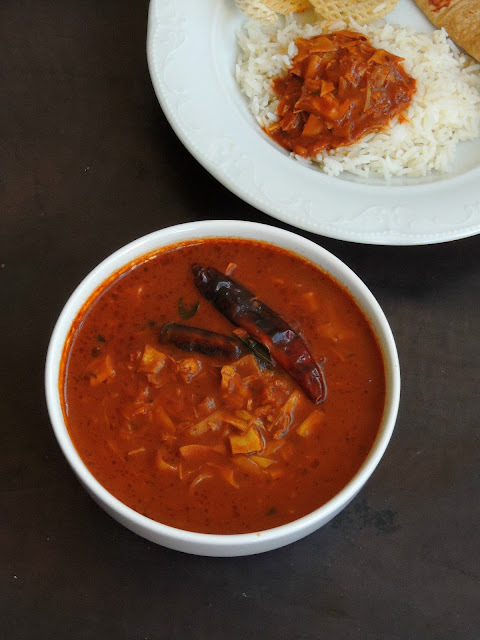 The author of this recipe says that many versions of this tomato saar exists, she also explained that coconut is also added in this saar dish, however she didnt added apart from cumin seeds, coriander seeds and red chillies in this dish to bring the flavor. Obviously i followed her dish completely as she went for,seriously everyone at home enjoyed this dish thoroughly with rice. 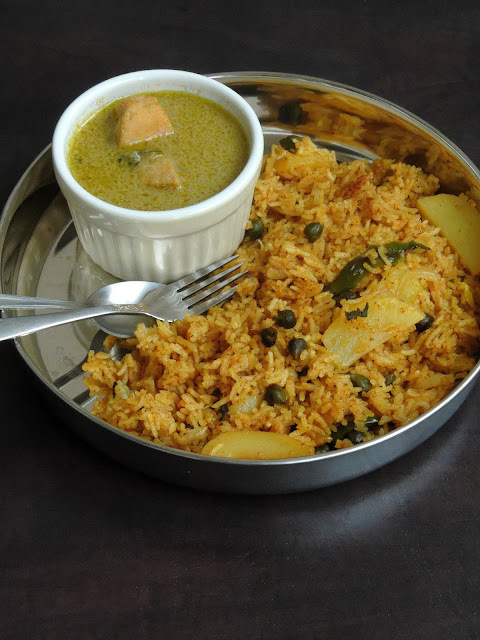 If you are looking for a comforting meal, dont forget to give a try to this simple but yet a delicious curry. 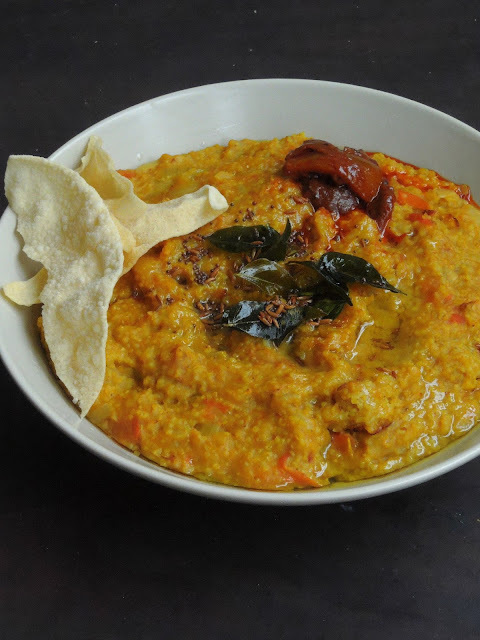 South Indian makes excellent tangy gravies with tamarind extract. Though i have already posted varieties of tangy tamarind gravies in my space, am yet to post some more delightful gravies. And my today's post is a No onion No garlic tamarind based gravy with Banana blossom and tomatoes. Banana blossom is very much used in South Indian cuisine. Though people dish out often some crispy vadas with this incredible banana blossom, you can make some delicious dishes with this extremely healthy blossom. Whenever i feel like making tamarind based gravies at home, i couldnt keep myself away from shallots and garlic cloves. Yes i cant make Kuzhambu aka tamarind gravies without these two. But i took an interesting theme to run this week of Mega marathon. You might have noticed that am running this month's blogging marathon with 4 themes for 4 weeks which sounds absolutely prefect for me to run this long month of blogging. Indian curries have onions and garlic as the most wanted basic ingredients for flavouring them. But however many interesting masala do exists without garlic and onions. My today's post is kinda restaurant style of Paneer butter masala without any onions,garlic but with heavy cream in it. You wont miss the onions or neither the garlic in this dish. Since this is not made with onion or garlic, you can relish this dish during fastings or vrats. 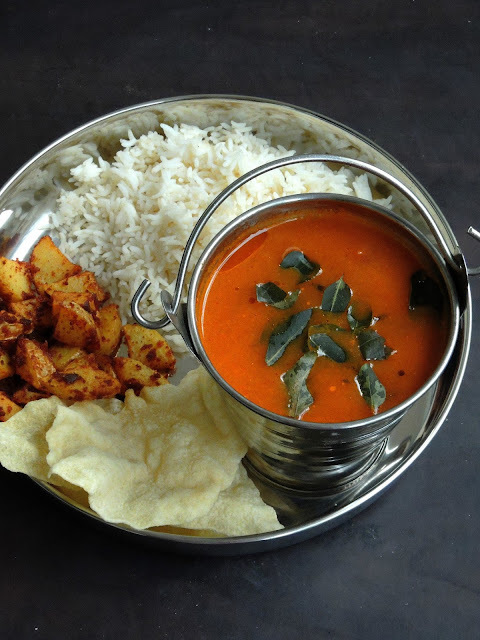 This dish is completely cooked in a rich tomato puree which makes an extremely delicious paneer loaded creamy tomato gravy which will definitely please your tastebuds as well as your eyes. This dish goes awesome with any sort of Indian flatbreads or pulao. 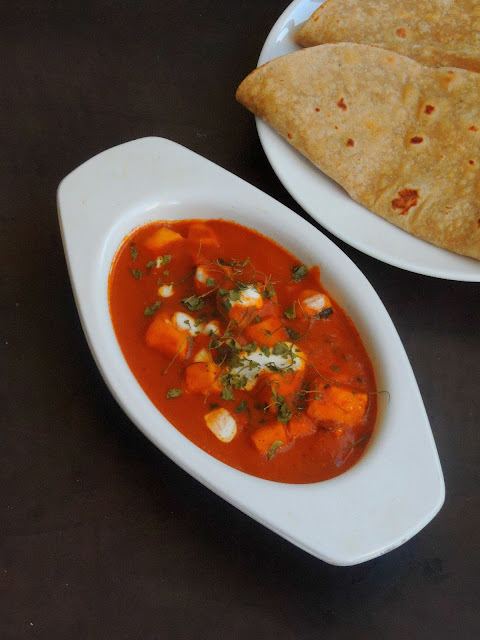 Though this dish is very simple to prepare, even beginners can dish out this fingerlicking paneer butter masala with less efforts than comparing to the usual dish. 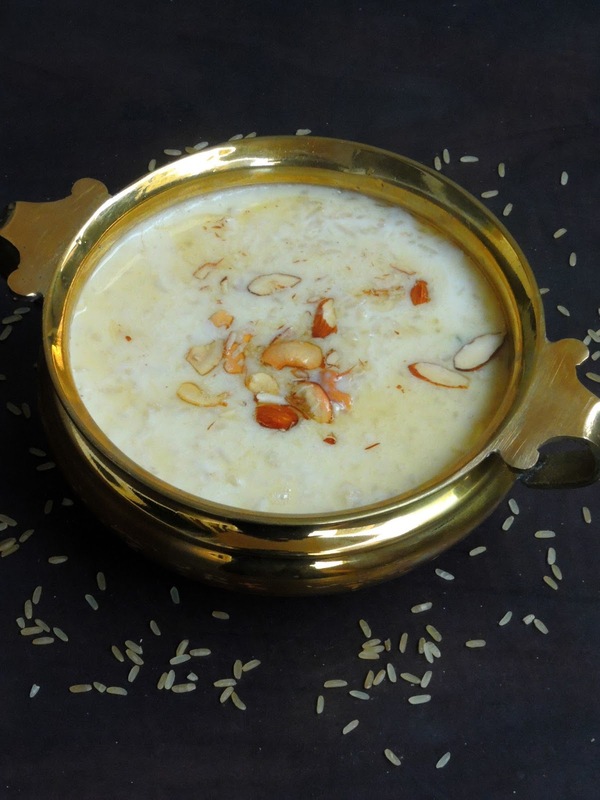 Kurma is a flavoursome rich gravy which can be relished either with rice or rotis. I do prepare varieties of kurma with different vegetables or meats. Since i have be running this week's blogging marathon of this month's Mega marathon with No Onion No Garlic dishes as theme, i want to experiment myself to prepare a delicious kurma. Personally for me Kurma cant be prepared without both onions and garlic, but after dishing out my today's post, i have completely changed my vision. Yes you can prepare some fingerlicking kurma without onions and garlic. 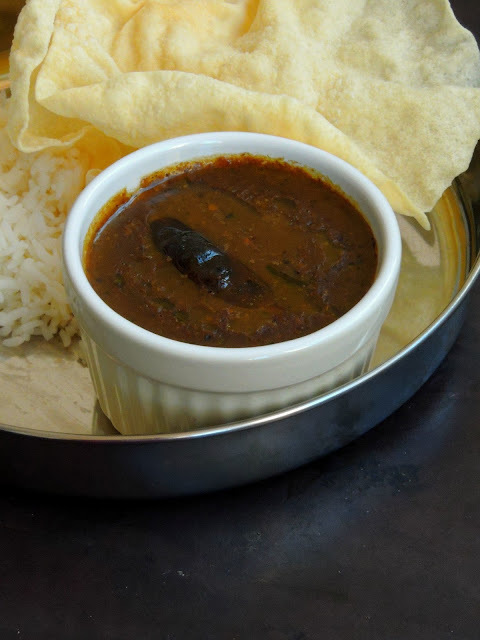 With simple cooking method and a fabulous flavorsome rich grounded masala paste, you can prepare this aromatic kurma. I love the flavor of capsicum in kurmas, however if you want to dish out this kurma with any sort of vegetables, please dont forget to add them as you desire. Am kick starting my second week of this month's Mega marathon with an another interesting theme. As i told earlier am running this month's marathon with 4 different themes. After posting 6 International breakfast dishes from different part of the world, this week's posts are going to be some fingerlicking delicious gravies with No Onion No Garlic as theme. South India gravies or curries are rarely prepared without onions & garlic. Even i cant imagine making gravies without these two ingredients. Obviously my vegetable basket will always have both onions and garlic in stock. When i picked the NO onion NO garlic dishes as theme for this week's blogging marathon i prepared a list of no onion no garlic dishes and picked 6 among those dishes which are usually prepared with loads of onions and garlic cloves. My own version of Pepper gravy aka Milagu kuzhambu always have shallots and handful of garlic cloves. When i planned to cook Pepper gravy for this theme,its seriously hard to skip these two ingredients,but still you can prepare this dish specially for No onion No garlic dieting peoples. Hootenanny is a baked version of German pancakes which is an easy, weekend special breakfast recipe which is know with different names. 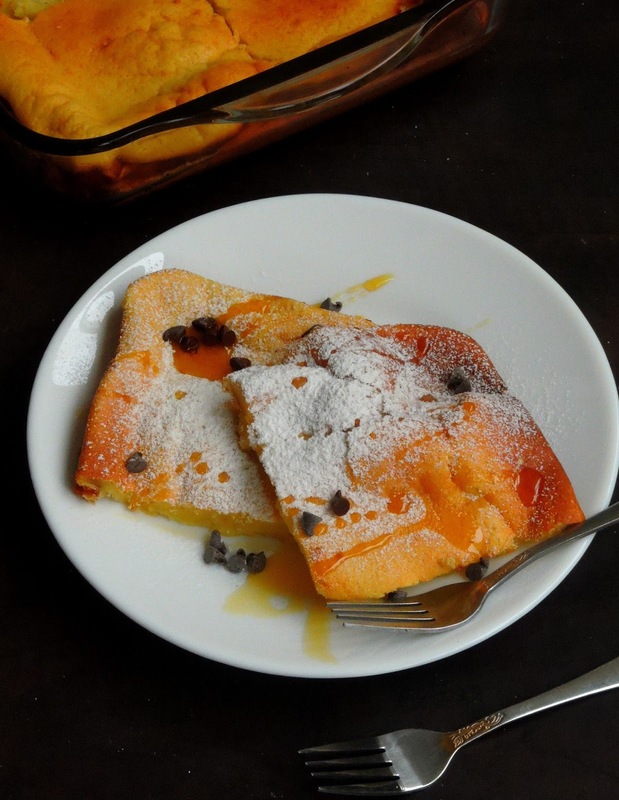 Yes dish is also known as oven pancake, Hootnanny cake or else as Dutch baby pancakes. The speciality of the Weekend breakfast dish is this dish calls for basic ingredients which we usually go for making pancakes. Put all the ingredients in a blender, blend as smooth batter, once poured in a greased deep baking glass mould, this dish is baked in oven for alteast 20-25minutes. Obviously not need to sit and keep an eye on your pancakes, yes quite an interesting breakfast dish to dish out when you dont feel like spending much time in your kitchen especially during weekends. Trust me these German baked pancakes suits absolutely prefect for a weekend brunch to serve and enjoy with your family members. These hootenannies is a cross between a pancake and French toast. 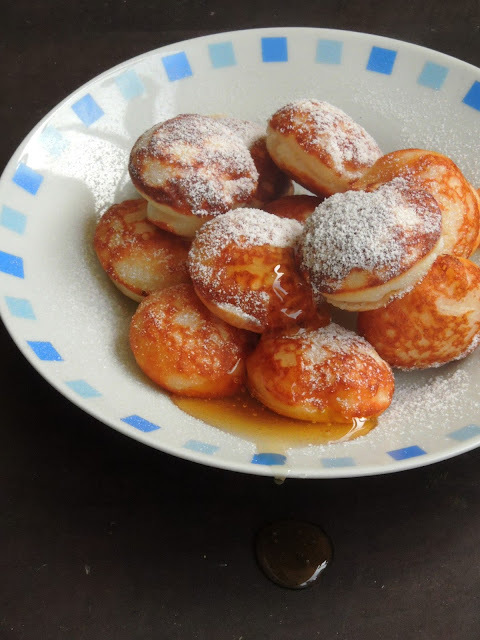 Vitumbua is a gluten free East African breakfast pancakes which is well known in most part of African countries. Though their name varies like Masa in Western African countries like Nigeria and Cameroon. This dish is eaten happily in Swahili countries like Kenya, Tanzania, Zanzibar,Uganda,Zambia Rwanda, Somalia, Burundi,Malawi and Mozambique. However you can even find this same Vitumbua in few Asian countries like India, Indonesia etc. Not only you can enjoy these gluten free Vitumbua for your breakfast, you can enjoy even for your evening snacks with some home made sauce or else simply with honey. Though this dish calls for spices like cardamom, nutmeg and almond extract, traditionally this dish is flavored with cardamoms. East African peoples enjoy this ultimate cuties with a cup of chai to finish their breakfast or snacks. Chebab/Chabab/Shebab is one of the most known Arabian pancakes which is eaten for breakfast simply with butter,honey,sugar, jam or else with date syrup. 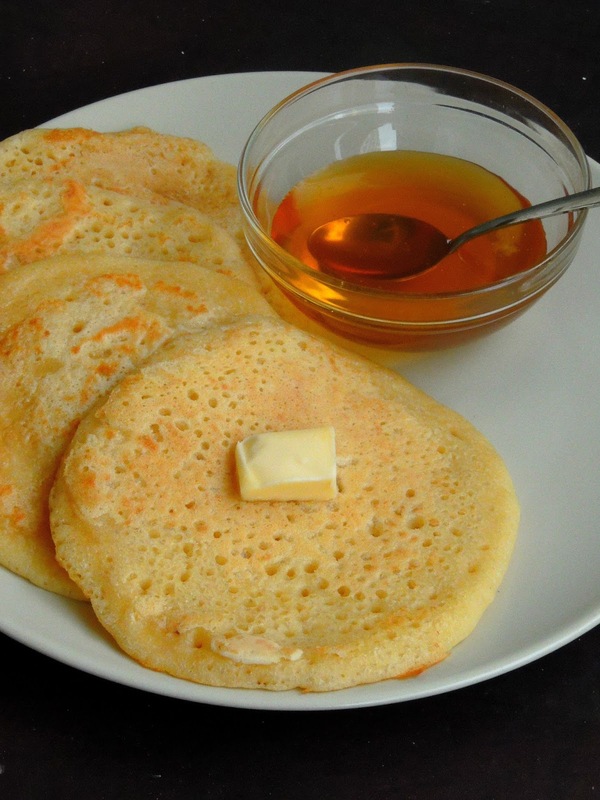 Chebabs are yeasted pancakes and they are the most liked breakfast of many in Arabic countries. These chebabs have their own place even in Ramadan meal. Flavored with cardamom and saffron,these pancakes are simply fabulous to indulge with some buttery honey sauce. Chebabs do exists in two versions, for the old version of chebab,dates are used instead of sugar. If you check for this Chebab recipe, you will surely find them out with dates in them. 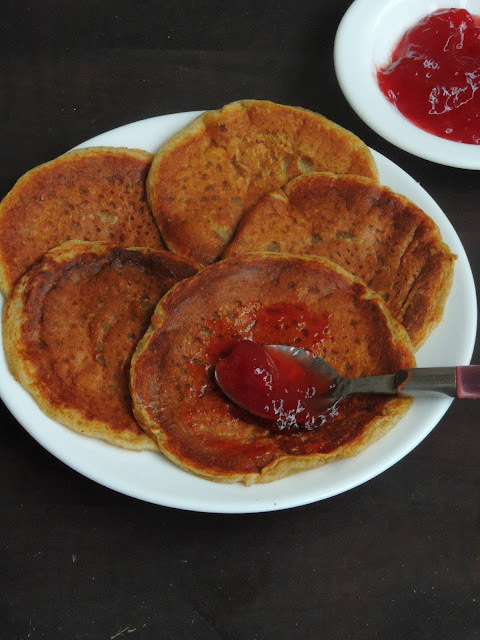 Dates are soaked in hot water until they turn soft and later they are used in making this super flavourful pancakes. And the other difference from most of the pancakes is this pancakes calls for yeast. Often baking powder is used as leavening agent in most of the pancakes, but this Emirati pancakes calls for yeast hence these pancakes are slightly heavier and spongy than the other pancakes. I cant imagine a breakfast without breads, that too freshly baked homemade breads are seriously a blessing when you prepare your brunch or breakfast especially on weekends. When i picked International breakfasts as theme for this week's Mega marathon, i immediately looked for a popular bread from European countries. And this Danish breakfast buns tempted me a lot to give a try as i love to bake breads at home. 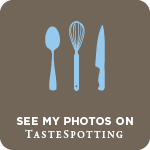 I grabbed this Rundstykker from My Danish Kitchen, seriously i love this blog as this space is full of Ultimate Danish dishes. I have already tried couple of Danish dishes from the space, hence i couldnt stop myself to bake this cuties to go under the theme am running for this whole week. After some Norwegian pancakes, am taking you all to USA, yes my today's post is one of the most known pancakes. 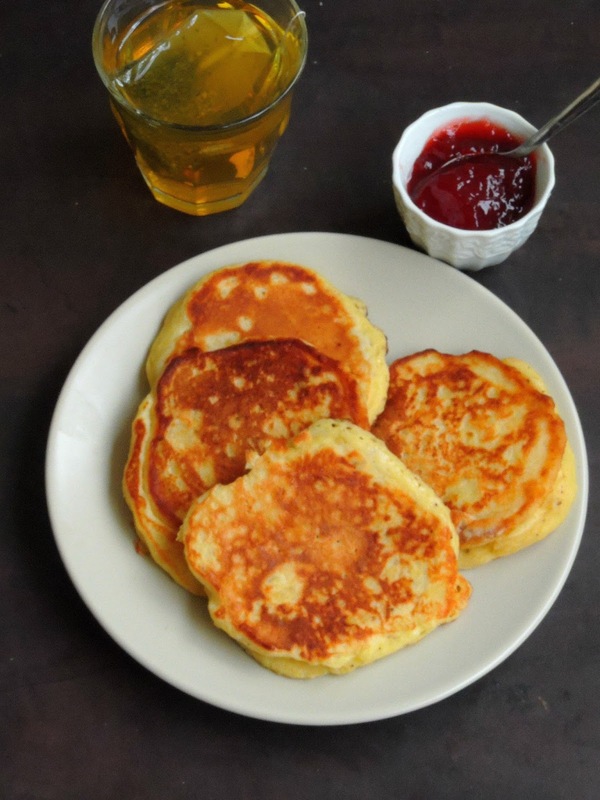 Mashed potato pancakes is a very common dish in most of the countries around the world. Many versions do exists especially in European countries, Europeans add some cheese or spices depending upon the countries, however this mashed potato pancakes are from America. While i was looking for a well known American breakfast dish, this mashed potato pancakes caught my eyes. Simple and very easy to make, this pancakes are definitely a satisfying and super filling breakfast to enjoy with your favourite spread. April starts with a bang, we blogging marathoners gonna run a month of blogging with sundays off. Yes here comes an another month of Mega food marathon, every year a group of food bloggers who shares the same passion for food ran two whole months of Mega marathon. We picked April and September as mega marathon months and we have been following this ritual since 4 years. This Mega marathon needs some pre-planning as we have some particular themes to follow. Eventhough i plan my cooking before i always end up in cooking at last moment. Thats gives more thrill to me. Let me stop blabbering before you guys gets bored. And this month Mega marathon have two options, yes either pick a theme per week, or pick a theme and cook for a month. Obviously i opted for the easy one, yes am going to blog for 4 weeks with 4 different themes. With a super duper busy schedule, i cant go with a theme for a whole month. However i dont regret to pick easy themes as they do need more patience and planning to cook with. For the first week of this Mega marathon, am going to showcase International breakfast dishes. 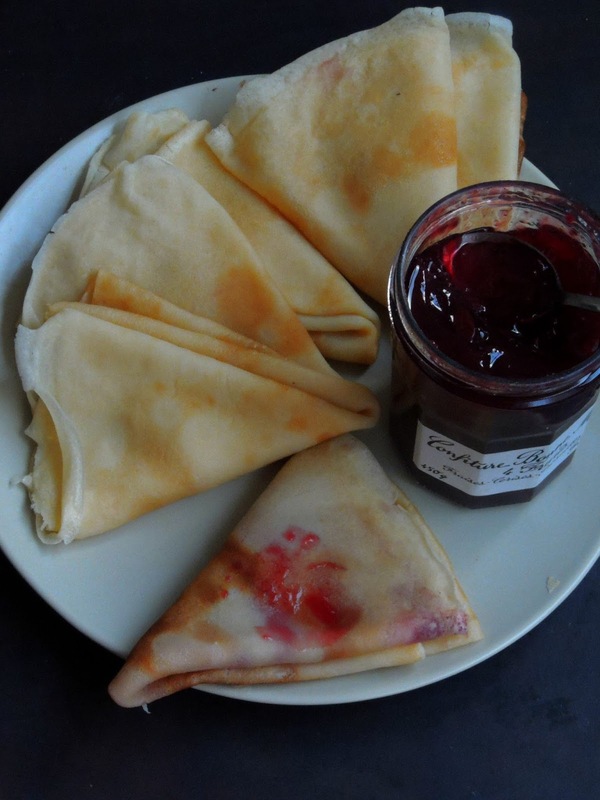 And for the first day, its going to be some filling Norwegian pancakes aka Pannekaken. Today is Easter here, and i cant imagine Easter without hot cross buns. 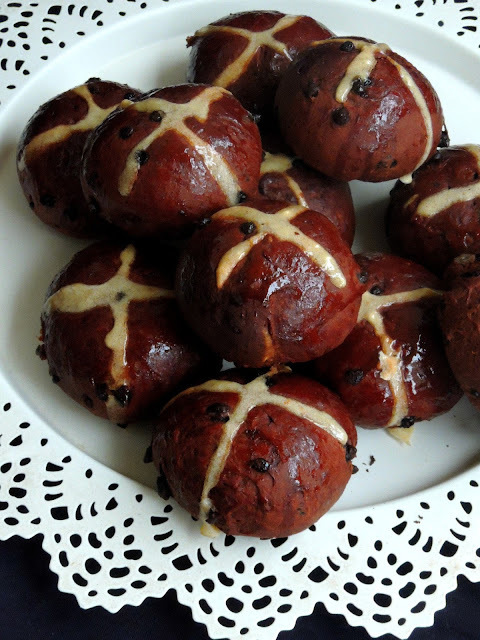 Though i have tried couple of Hot cross buns, i was looking for a chance to bake some chocolate loaded hot cross buns. Chocolate is our family favourite, obviously i couldnt stop myself to bake some chocolate loaded hot cross buns.Wiki says that "A hot cross bun is a spiced sweet bun made with currants or raisins, marked with a cross on the top, and traditionally eaten on Good Friday in the British Isles, Australia, Canada, New Zealand, South Africa and some parts of the Americas". The cake marks the end of Lent and different parts of the hot cross bun have a certain meaning, including the cross representing the crucifixion of Jesus, and the spices inside signifying the spices used to embalm him at his burial. They are now available all year round in some places.